You may need an instant screen record or require to capture some video online, you’ll find enough paid apps to get the job-done. Unfortunately, some of us don’t really need to be purchasing an app to get an occasional screen grab. While Goggling few days back for best screen recorder, Google gave me an option for web-based screen recorder and just because of my eagerness to use web-based screen recorder, I suddenly downloaded the software and believe me after using it, I am fond of that application which is knows Apowersoft Free Online Web-based Screen Recorder. 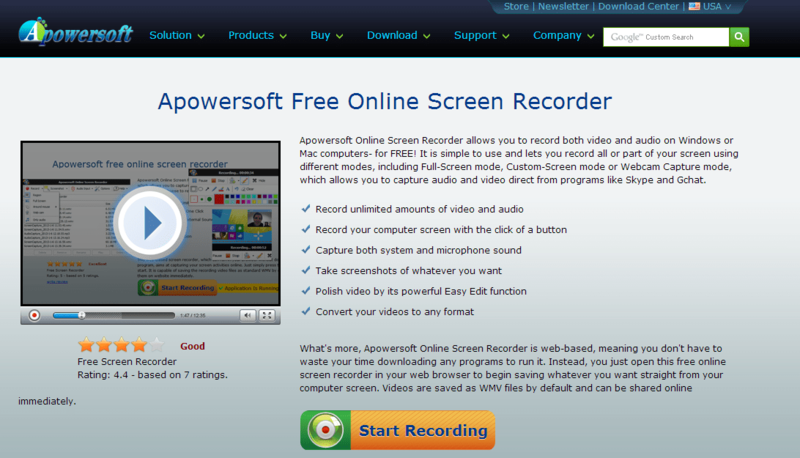 The Apowersoft Online Screen Recorder makes it effortless to record both video and audio on both Windows and Mac computers without cost. It’s convenient to use and allows you to record all or part of your screen by using the different modes made available, including Full-Screen mode, Custom-Screen mode or Webcam Capture mode, which empowers you to capture audio and video direct from programs like Skype, Facetime and online apps like Google Hangouts and Facebook chat. On top of that, there’s no time limit! With just one click, you can capture screen online for posting. Quickly create whatever type of video you want: tutorials, lectures, or funny videos. Apowersoft Online Screen Recorder’s flexible design lets you record all or part of your computer screen with ease. Unlike other screen recording tools, Apowersoft Online Screen Recorder doesn’t limit what or how much you record, letting you save entire TV shows or class lectures for later use with ease. If you have ever made a video demo, you will appreciate that Apowersoft Online Screen Recorder allows you to capture video and audio simultaneously. You can record whatever you are doing on your computer screen and pair it with sound from your computer or your microphone. This is just one more reason this screen recording application is the best free screen recorder available today. Apowersoft Online Screen Recorder’s WebCam Capture feature makes your life easier by allowing you to record multiple web cam videos side-by-side using popular chat services, like Skype, Gchat, and many others. In addition, you can resize the camera picture to meet your exact requirements. Come across an interesting image on the internet that you want to save for later? Save it in .PNG, .JPG, .BMP, .Tiff or .GIF format. You can also use it make a quick edit to that image before saving it. With this web-based screen recorder, you don’t have to wait until you are finished recording to brush up your video. Instead, while still recording, you can add colors, shapes, notes, and different icons like arrows using its toolkit. The result is a high quality video that you can publish to a website immediately. You can convert your videos to a wide range of formats with only a few simple clicks. All you need to do is click the Online Convert button and follow the steps from there. Nothing too fancy, here, just undemanding, free online web-based screen recorder.